Some Neenah school classrooms may soon be getting a makeover that will not only give students a little more physical activity, but also improve their learning experience. Coolidge Elementary School and St. Margaret Mary Elementary are both raising funds to add alternative desks to their classrooms. As a whole, Americans sit way too much and students are no exception. The addition of standing desks, wobble chairs and tables where students can stand or sit allow students to position themselves in their classrooms so they’re ready to learn. School districts across the country are adopting standing desks as an option and research shows that schools with standing desks as an option for students saw test scores increase 10 to 15 percent, says Dr. Ann Liebeskind, an expert in lipidology, or the study of cholesterol, and the operator of the Neenah-based Mobile Health Team. Tina Fairweather, associate principal at St. Margaret Mary, says teachers notice some students are more engaged and learn better when standing. “There are several reasons we’re looking to pilot stand-up desks – they help keep students engaged, there are physical health benefits and they have better posture. We want to help students that need to move to handle their excess energy be able to do that,” she says, adding the stand-up desks have a swinging bar on the bottom. St. Margaret Mary is looking to add one standing desk to each classroom in grades 1 to 5 and to the foreign languages room and computer lab. Individual teachers would decide how best to use the desks. The school is using its annual Wines Around the World fund-raisier to help designate funds to purchase the initial desks. 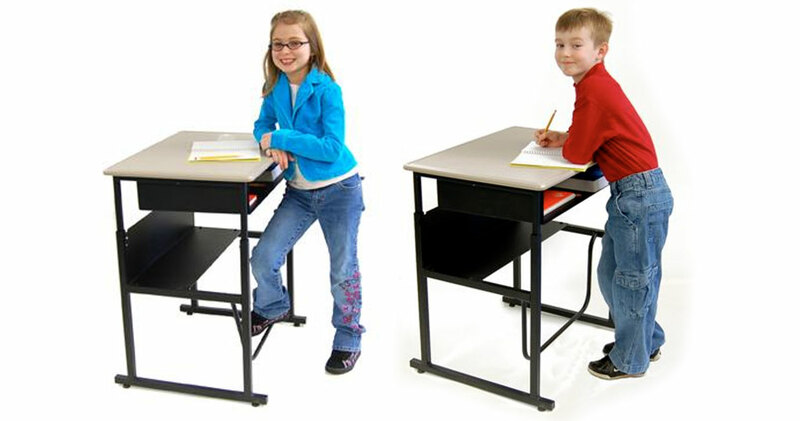 After the pilot project, more stand-up desks could be added based on the feedback from teachers and students. Coolidge is looking to raise $10,000 to outfit one classroom with the alternative seating options as a pilot experiment. The new seating options include standing desks with a stool so students can also sit and flexible tables that can be positioned so students can sit or stand. If that goes well, the goal is to keep raising funds and modify other classrooms with the new desk options. For a total of $200,000, the entire school would be outfitted with new equipment. Coolidge Principal April Keepers says the school set up a special fund at the Oshkosh Community Foundation to hold the funds until enough is raised for the project. The first goal is to hit $10,000, she says. Schools recognize that different students have different needs when it comes to learning, which is why teachers at St. Margaret Mary utilize exercise balls for some students to sit on instead of standard desk chairs or using exercise bands on the rungs of the chair so a student can “bounce” their feet without anyone noticing, Fairweather says. All students benefit from more physical activity, Liebeskind says. It’s no secret that childhood obesity is on the rise and much of that can be attributed to kids spending too much time sitting down, whether it’s in front of a computer, TV, tablet or other electronic device.